Of course, proper brushing, flossing and periodic cleanings and exams in our clinic contribute to a healthy smile. But sometimes, even with the best dental care, you can experience tooth decay, cracked and chipped teeth or even missing teeth that affect the way you look and feel about yourself. 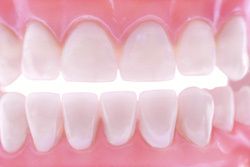 And that’s where restorative dentistry comes in handy to correct your smile problem and give you your confidence back! Restorative dentistry is designed to fix the problem with your teeth, relieve pain and pressure and provide you with a natural fit that replaces one, several or all of your missing teeth. Give us a call today.